Update 7 a.m. Thursday: A steel I-beam was placed over the damaged portion of Blagen Road and straps were fastened around the exposed water transmission main to help support it. Thanks to T&S Construction and CCWD staff for working through the night to help stabilize the pipeline. Update 6:30 p.m.: CCWD will be working with T&S Construction crews throughout the night to stabilize the threatened main water transmission line.While the line is threatened, it has not broken and Arnold’s water quality and supply are normal at this time. Original post: The series of storms that has drenched Calaveras County over the past week caused flood waters in Big Trees Creek to overwhelm the culvert under Blagen Road in White Pines. About half the roadway has sustained significant flooding damage and is impassable, and Blagen Road will be closed to the public on the south side of the bridge until further notice. Along with damaging the roadway, the flood waters washed away dirt and pavement and exposed CCWD’s main water transmission line that serves the town of Arnold and is buried under the bridge across the creek. 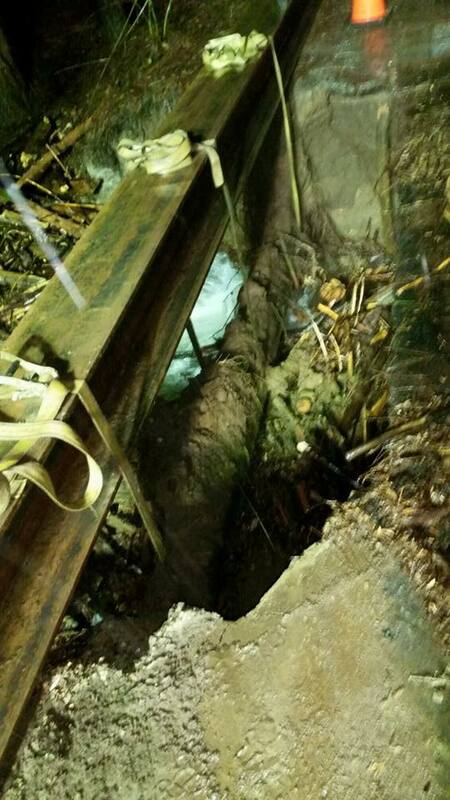 As of Wednesday evening, the swollen stream is still flowing around the exposed pipe, and the District is concerned that debris in the water could cause the pipe to break. If this occurs, water service could be disrupted to many customers in Arnold. The District is in the process of working with Calaveras County Public Works to hire contractors to perform an emergency repair project that would construct a temporary emergency bridge over Big Trees Creek and take measures to protect CCWD’s main water transmission lines from being damaged. This project is expected to begin by Thursday or Friday. District crews are closely monitoring the situation, and are taking what measures they can to protect the pipes from damage. CCWD will post updates about this emergency project when they become available at www.ccwd.org. The red X marks where the bridge is closed at Big Trees Creek. Are there any updates on this? I have a 90 yr old mother who live on E. St. in White Pines.